The U.S. just released its last Uyghur prisoners. Is this the end of U.S.-China anti-terrorism cooperation? The U.S. Department of Defense announced Tuesday the transfer of three Uyghur Chinese prisoners to Slovakia. 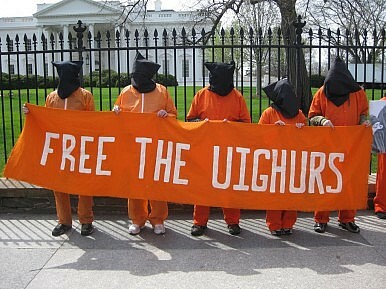 According to Pentagon Press Secretary Rear Adm. John Kirby’s statement, the three men “are the last ethnic Uighur Chinese nationals to be transferred.” Kirby further noted that “the United States is grateful to the government of Slovakia for this humanitarian gesture and its willingness to support U.S. efforts to close the Guantanamo Bay detention facility.” Previously released Uyghur prisoners have gone to countries around the world, including Palau, Bermuda, Albania, and Switzerland. China, meanwhile, was not so pleased with Slovakia or the United States. Foreign Ministry Spokesman Qin Gang said that the three former prisoners are members of the East Turkestan Islamic Movement — “they are terrorists without any doubt.” Qin added that the men “will not only pose [a] severe threat to China’s national security, but also to that of the recipient country.” He called on the “relevant countries” to “not provide those who commit terrorist crimes with safe haven and send those suspects back to China.” The Slovakian Interior Ministry, however, has said that none of the men are terrorist suspects. Slovakia currently has no plans to repatriate the Uyghurs to China. According to files posted by WikiLeaks, the three men released this week, Yusef Abbas, Saidullah Khalik and Hajiakbar Abdul Ghuper, were all captured in Pakistan with other Uyghurs in 2001. The U.S. government’s assessment in 2004 was that each man “has had some level of terrorist training … and is highly vulnerable to future recruitment by terrorist groups.” However, in 2008 a U.S. Federal District Court judge ruled that the men were not a security threat. The judge ordered the U.S. government to release the Uyghurs and allow them to settle in America. Despite the judge’s order that the Uyghurs be released within a week, the final three detainees had to wait over five years for their freedom. An appeals court ruled that the federal government did not have to resettle the prisoners in the U.S. — and none of the men were given that option. The U.S. didn’t want the prisoners remaining on American soil, but also refused to send them back to China, due to concerns that the men would be mistreated by the Chinese government. This made it difficult to find the Uyghurs a home. A U.S. senior military official told the Washington Post that Beijing was pressuring other countries not to accept the Uyghur prisoners. The official said that a possible deal to settle the final three men in Costa Rica fell through because of Chinese opposition. I wrote earlier that the United States’ war on terror has also benefitted China, with U.S. drone strikes presumed to have killed several leaders of the East Turkestan Islamic Movement. Suspected Uyghur terrorists were also among the detainees at Guantanamo Bay — according to files released on WikiLeaks, there were 22 Chinese nationals in Guantanamo, all considered to be “probable members” of the ETIM. The U.S. fight against Al Qaeda had netted this group of men, who were suspected to have attended terrorist training camps. In later years, however, the U.S. government began to back away from these accusations. With the release of the final Uyghur prisoners from Guantanamo, it seems that the golden age of U.S.-China cooperation on anti-terrorism may be at an end. The current rhetoric surrounding violence in Xinjiang suggests that the U.S. government is turning away from the Bush-era classification of ETIM and other Uyghur groups as Al Qaeda affiliates. As a result, U.S. and Chinese perspectives on the threat of terrorism in Xinjiang are becoming more and more divergent. For example, Washington’s response to Beijing’s reports of a terrorist attack near Kashgar makes no mention of terrorism. State Department Deputy Spokesperson Marie Harf said in a press briefing that the U.S. government was “closely following reports of continuing violence” in Xinjiang. “We continue to call on the Chinese Government to permit its citizens to express their grievances freely, publicly, peacefully, and without fear of retribution. We also call on Uighurs to not resort to violence, [and] for the Chinese security forces to exercise restraint,” Harf said. Obviously, this is a response more concerned with human rights violations than with terrorism. When asked about the difference between that response and immediate U.S. condemnations of the terrorist attack in Russia, Harf said the U.S. government was “still trying to gather all the facts” about the violence in Xinjiang: “We don’t just jump to conclusions or call things by a certain name if we haven’t gathered all the facts ourselves.” In other words, the U.S. government is no longer on the same page as China when it comes to defining Uyghurs as terrorists. For a while, during the Bush administration, anti- and counter-terrorism operations were one bright spot in the U.S.-China relationship. While China was not particularly active in U.S. efforts to root out Al Qaeda in Afghanistan and Pakistan, it was supportive of these actions. Now, however, China is sharpening its focus on counter-terrorism even as the U.S. winds downs its own wars in the Middle East. With U.S. officials showing a new reluctance to classify Xinjiang violence as terrorism, the issue is likely to become a source of disagreement rather than a true common interest. In this context, the release of the last Uyghur prisoners from Guantanamo is particularly symbolic. The U.S. has now completely cut any ties between its own war on terror and China’s fight against the ETIM. China Confirms 3 Dead, 79 Injured in Urumqi Terrorist AttackTurkestan Islamic Party Expresses Support for Kunming AttackChina, Uyghur Activists Dispute Nature of Latest Xinjiang ViolenceWhat Trump’s Pakistan Policy Means for ChinaThe Islamic State Just Threatened China. What Will Beijing Do?